Tryptophan is an amino acid that aids the production of melatonin and serotonin which control our sleep/wake cycle. Pumpkins are rich in tryptophan which can help people fall asleep easy. Foods, like pumpkin, that have tryptophan must be eaten with high glycemic carbohydrates for better absorption. 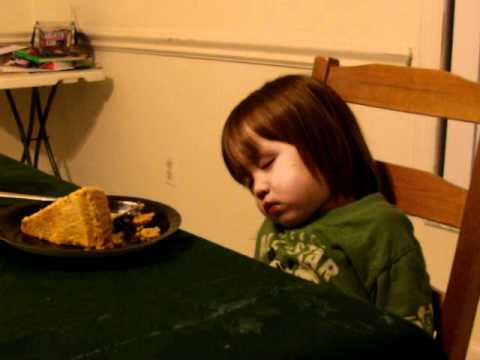 This is why you feel lethargic after you have had your Thanksgiving meal of turkey, mashed potatoes and pumpkin pie. Mashed potatoes are high glycemic carbohydrates while turkey and pumpkin pie are loaded with tryptophan. Tryptophan works during the day to promote serotonin that helps with depression and anxiety, while at night it produces melatonin that causes us to feel sleepy. How much tryptophan is in pumpkin? Homemade pumpkin pies have .0915g for a slice of pie 1/8th of 9” in diameter. Commercially prepared pumpkin pie has .0556g for a piece that is 1/6th of an 8” pie. Canned pumpkin pie mix contains .0351g per 1 cup. Besides a hearty pumpkin pie try using pumpkin in lighter dishes like a smoothie or soup. Ever have a pumpkin pie smoothie with tofu? Tofu is an inexpensive source of protein that contains a high percentage of tryptophan. Tofu can lower LDL cholesterol and triglyceride levels while possibly raising HDL cholesterol. The selenium in tofu is an excellent anti-oxidant and anti-inflammatory agent. Make sure your tofu is used from non-gmo soy. Add all ingredients to blender and blend until well combined. Add extra milk if necessary, and serve with an additional small sprinkle of cinnamon and nutmeg on top. Before you bake this zingy soup in its pumpkin bowl, you must first pick the perfect pumpkin. Select one without blemishes or cracks and with a flat bottom so it won't tip as you serve. Slice off the top fourth of the pumpkin with a large sharp knife; set aside. Scoop out seeds and stringy pulp. Replace top of pumpkin. Place pumpkin on a 15x10x1-inch baking pan. Bake in a 375 degree F oven for 50 to 60 minutes or until flesh can be scooped out easily. (Pumpkin will not be tender at this point.) Cool slightly for easier handling. Scoop out and reserve pumpkin flesh, leaving about a 3/4-inch thickness of flesh on pumpkin walls. Cut flesh into chunks (you should have about 4 cups). Do not remove any flesh from bottom of shell. Discard pumpkin top. Combine the 4 cups pumpkin flesh, broth, apples, carrot, ginger, curry powder, and cumin in a large pot. Bring to boiling; reduce heat. Cover; simmer for 10 to 12 minutes or until vegetables are tender. Blend or process mixture, a third at a time, in a blender or food processor until smooth. Place pumpkin shell in a 3-quart casserole. Pour soup into shell. Bake, uncovered, in a 375 degree F. oven for 20 minutes. Meanwhile, cook bacon in a skillet until crisp. Remove and drain, reserving 1 tablespoon drippings in skillet. Cook onion and sugar in reserved drippings until onion is tender. Finely crumble bacon. Stir bacon and croutons into skillet. Sprinkle bacon mixture over soup in pumpkin. Makes 8 to 10 side-dish servings (about 8 cups). Make ahead tip: If desired, discard pumpkin shell. Cover and chill precooked pumpkin up to 24 hours. Continue as above except do not bake in shell. Nutrition Facts: Calories 118, Total Fat 4 g, Saturated Fat 1 g, Cholesterol 7 mg, Sodium 678 mg, Carbohydrate 17 g, Fiber 2 g, Protein 7 g. Daily Values: Vitamin A 29%, Vitamin C 11%. Along with tryptophan pumpkin seeds are a good source of protein, as well as, iron, zinc, magnesium, phosphorus, copper and potassium. A quarter cup of seeds can provide over 20 percent of the recommended daily intake. According to the USDA, one gram of roasted seeds contains 5.69mg of tryptophan and one gram of unroasted has 17.2mg. One cup of milk has 183mg. Eating some seeds can be used as a preventative measure against anxiety attacks, clinical depression and other mood disorders. Completely un-hulled seeds can keep well for few months placed in cool dry place. However, hulled pumpkin kernels deteriorate soon if exposed to warm, humid conditions; therefore, should be placed in an air-seal container and stored inside the refrigerator. Unlike tree nuts allergy, it is rare to find true pumpkin seeds allergy incidences. However, in people sensitive to nuts/seeds a few allergic symptoms may appear due to antigenic cross-reactions with some other nuts, seeds and fruits, especially of anacardiaceae family such as mango, cashew nuts, pistachio etc. Persons with known allergic reactions to these seeds may therefore need to observe caution while eating them.